Analogue to electronic: Meet Hybrid Machina, Hack Sounds’ first band – the 107 blog. In January, a new name appeared on the lineup at Eklecto, 107’s first music festival of the year. Hybrid Machina, composed of Chentduren Aumkaran, Carmen Louie and Annabel Tan, had not only never played a gig before – they’d written their whole set in just under a month. Working in IT and finance, music had only ever been a creative outlet for the three. That is, until a chance Google search led them to Hack Sounds, 107’s fledgling electronic music education program. We sat down to find out how a rapper, a drummer and a jazz-loving saxophonist found a home in electronic music, and where Hybrid Machina will lead them. Hey guys! What do you do when you’re not making music? Carmen: For work I do IT stuff at a bank – business analysis and that kind of thing. Music is where my passion is at. Work is just work. Chentduren: I have a Maths and Stats background from university. I was previously working as a developer, and now I work in reporting, which is totally boring! In my spare time I try and keep up with the recent trends in technology, and I also try to practice my guitar or Ableton. Music is a great way to let things out and express myself in a way that I can’t at work. Annabel: I’m a trained yoga teacher, I’m a trained librarian, I’m a fire dancer… I do lots of different things. I’m trying to start up my own business at the moment, which is taking up a lot of my time. I also try to play saxophone every day, and cook. How did you come across Hack Sounds, and what made you decide to start? Ch: I’d always seen interviews on Youtube of artists, mainly American artists, who would talk about these cliques, where they meet each other and work together on music. I thought, is there anything in Sydney which is similar to that? I Google searched and Hack Sounds came up. The bio for that talked about hardware and collaborative process, which is exactly what I was interested in, and I thought I would give it a try. That was like a year ago. It’s really hard to find that kind of stuff in Sydney. There might be others, but I haven’t come across anything other than Hack Sounds. Ca: For me, I had just got back from working in Melbourne for a year. I felt like I needed something to give me a routine, to fill in my spare time. At the time I was starting to get more interested in music, but I didn’t have a musical background. I found Hack Sounds on Meetup, and I think they were towards the end of their first term. I sent an email and asked whether I could still join in. I just wanted to get more of an idea about it, and I’ve been stuck with it ever since. A: Unless you go and enrol in a formal setting, there is no other way to work out what pieces of gear do. Hack Sounds was a great way for me to focus on something, to get to know people but not have to engage with them. I know that sounds really bad, but in some senses I’m pretty introverted! I’ve thoroughly enjoyed it. There’s no stress, there’s no exams, and you get to meet loads of interesting people with all different abilities. I really enjoyed that part of it too, because in my normal day to day I don’t really meet many people with disabilities. I’ve found that really enriching, in terms of my awareness of others, and the challenges they face. There’s no discrimination. We do all the same things. It’s a really supportive environment, so I’m glad I stuck out with it. Ca: It’s an eye opener. You learn so much through Hack Sounds, and you don’t get that anywhere else, but it’s the people side that I think has been the most rewarding. A: It’s a very ego-free zone. There’s no posturing, no judgement. I really enjoy the fact that everyone has a go, you can just be yourself. Ca: And it’s for free! What have you learned at Hack Sounds? Ca: One thing I’ve learned is to listen out for everyone else. At the start it was just a mess, but gradually we learned that every instrument has its own frequency and how to listen for that frequency. Eventually we got it to a point where it started sounding like a track. Ch: Learning to jam together. Another thing for me was the opportunity to learn about inclusive music. There were some sessions which were a bit out of Hack Sounds, where we got to play around with Makey Makey and other instruments that allow people with disabilities to make music. A: During Hack Sounds, Chentda, Carmen and I just got on really well. Then we found out things about each other – Carmen plays drums, Chentda plays guitar, I’ve got the saxophone. Then I was like, you know what, we keep talking about it, let’s just jam! So we picked a day and got together and started jamming. I badgered these guys basically. Ca: Annabel was like let’s jam, and we were all like yeah, yeah whatever, and then she just ended up persisting on it, and we eventually decided to give it a go. Annabel lives in the city, and that became the central point to bring our gear and just do it. We weren’t expecting anything, just to play. Ch: At work somebody mentioned the term ‘lean hybrid data’ and I didn’t know what it meant but I thought it sounded like a pretty cool band name. I messaged these guys and said what do you think? Ca: And I said exclude the data bit. And then Annabel comes in and says what about Hybrid Machina? 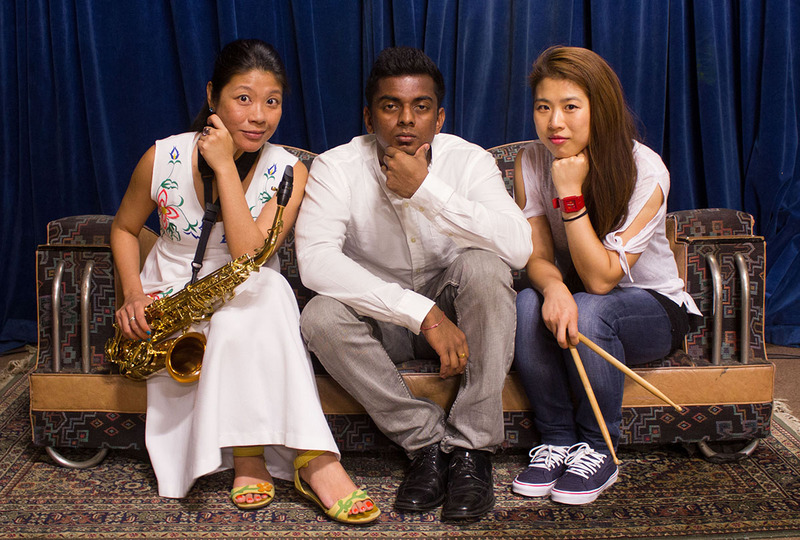 A: We all started out as analogue – Chentda brought his guitar, Carmen brought her drums, and I’ve got my saxophone. Ca: Then we got our first gig at Eklecto and it was in a month, and we didn’t have any songs. There was no way that we were going to have solid acoustic songs in a month, and that’s when Liz suggested we go back to the electronic side. A: Totally! We basically jammed for that four weeks leading up to it. Ch: We aim to make chill hop music. My main influence is hip hop, Annabel’s is jazz, Carmen’s is rock music, and I think chill hop kind of puts all that together. It incorporates all of those three elements and makes them into something different. A: We also like a driving beat behind it. Ca: I think because we get along so well, our music just meshes. It says in your bio, Chentda, that you’re a rapper? Ch: Yeah, when I was in uni I would write raps, and try to record them, but I’m more interested in the writing side than the performance side. Do you think you’ll incorporate it into any songs in the future? Ch: Yeah, I would like to, yeah! Ca: My favourite at the moment is Slum Sociable. Tame Impala too, and Hermitude. A: I’ve got a really broad musical taste. I love cinematic music and music from games, like Hans Zimmer. My background is in classical music, and I worked in a karaoke pub when I was underage, so I’ve got all of those influences too! Ca: I don’t expect anything. Even to be able to perform at Eklecto was huge for me. I never expected to be in a band. It was such a far-fetched dream for me, so even to just get to this point makes me really happy. If we can continue performing and getting songs out there, that’s really great for me. To hear more from Hybrid Machina, keep an eye on 107’s Facebook page. Interested in being part of Hack Sounds’ 2018 term? You’re in luck! Expressions of interest close Friday March 2nd. Click here to find out more.